The Child Care Coalition of Manitoba studied the economic and social impact of childcare in Thompson over 2006, and released a report in early 2007. The research was supported by a local Advisory Council of leading stakeholders (see below). The report outlines the multiple benefits of childcare, providing detailed information on Thompson’s families and children, its childcare services and early educators, and the economic effects of the childcare sector and its labour force. This report reviews the special contribution childcare can make in supporting Aboriginal children and families. Childcare in Thompson is in crisis – with a marked decline in total spaces and facilities over the past few years. Today, there are just 337 spaces to serve the city’s 3,290 children aged 0 - 12. This amounts to a low access rate of 10.2 percent, worse than the provincial average of 14.3 percent. Two childcare centres have closed since 2004, and a third is slated to shut down by fall of 2007. Thompson has long waiting lists, high parent fees, and a restrictive subsidy system. Many parents need extended hours care, which is currently unavailable. School age service is particularly inadequate. Thompson confronts a severe shortfall of trained early childhood educators: six of the seven centres cannot meet the provincial requirements for trained staff. Low wages and benefits are the main culprit behind the staffing crisis. 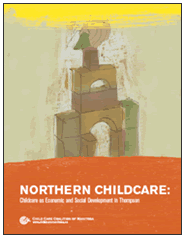 Historically, access to childcare has been low in the north, and services have been fragile. Causes of this instability lie in the lack of a public mandate to ensure childcare provision, an exclusive reliance on community delivery of childcare, and low levels of public funding. Even at its current small size, the childcare sector is valuable. Childcare contributes $2.1 million directly to the Thompson economy. As childcare revenue “ripples” through the economy, it brings total direct and indirect benefits of nearly $3.4 million. Every $1 spent on childcare returns $1.58 to the Thompson economy; in the long-term, the payback is even higher. Thompson parents are the biggest spenders on childcare, contributing to 60 percent of total revenues. Parent fees are an estimated $1.3 million, and having childcare enables parents to earn an estimated $18.8 million in wages. More accessible and affordable childcare would enable more women to work, providing some relief to local labour shortages and promoting women’s greater financial security. The childcare sector also provides jobs, mainly to women. There are 69 full and part-time childcare workers in Thompson, and the sector creates a further 34 full time equivalent jobs. More childcare services are needed in Thompson. An additional 1,406 spaces are required in order to meet the target of providing half of Thompson’s youngsters with access to early learning and care. Childcare must become more affordable and accessible to families, and the quality of care must increase. In particular, services must be more inclusive and responsive to Aboriginal families, who make up a growing share of Thompson’s population, as well as to children with special needs. The ECE labour force must be better supported and resourced, with more access to training. Childcare means business in the north, offering impressive benefits to children, families, and the Thompson economy. Childcare is a valuable investment in today and tomorrow. Thompson report [Adobe Acrobat PDF - 1.63 MB]. Thompson report summary [Adobe Acrobat PDF - 250.99 KB].